Let's Just Build a House! : New Art: Dad in house! New Art: Dad in house! We have some new semi-DIY Art in the living room/hallway. Adam has been on me to get stuff hung up in this house. I guess he's tired of staring at bare walls. 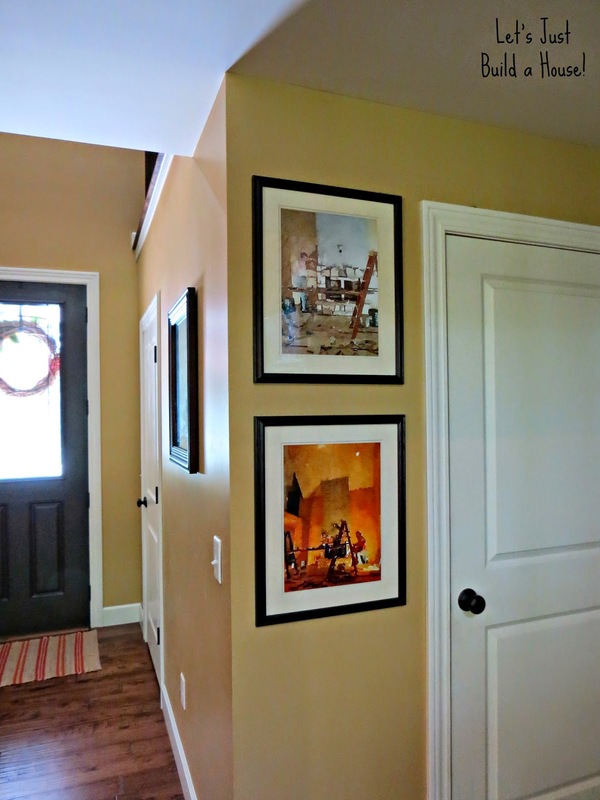 Hence my golden mirror gallery wall--which already needs some updated photos, we've added more! Lots more! But today I'm sharing something different on the walls. If you've been a reader for awhile you know my dad did our beautiful stonework on the front of our home, and the fireplace. By himself. Just my dad. He pretty much moved in with us for a few weeks at a time and worked 12 hour work days jamming out to the radio, cutting the stones, mixing the mortar, and placing the stones to the fireplace and exterior of the house. He doesn't do this for a living or anything, it's sort of a hobby for him. When we told him we were building we nicely asked for his help with the stonework. Not sure if he knew what he was getting into...however, it's our favorite feature on both the inside and the outside of the home. It's very special to both Adam and I.
I emailed them to a buddy at a local print shop, and ~bippity boppity boo~...I have some beautiful prints! I spray painted some old wood frames from the thrift store (which I forgot to take a BEFORE photo of! I'm slacking lately!) and also spray painted mattes white since they were an ugly peach color. I'd say I spent less than 20 bucks for both prints and the revamped thrift store frames and mattes combined. Not bad for some large art pieces with meaning. Am I right? 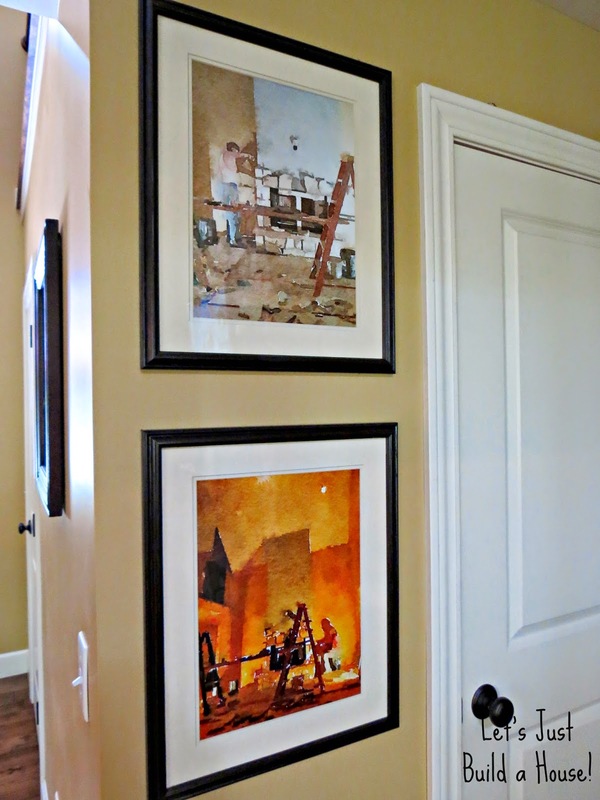 We hung them in the living room hallway. It's a nice reminder of my dad's hard work, and it's nice to have meaningful artwork in our home for us to see, and our guests too! PSSSSTTTT! Read more about my dad doing the stonework himself on our home Here and Here! 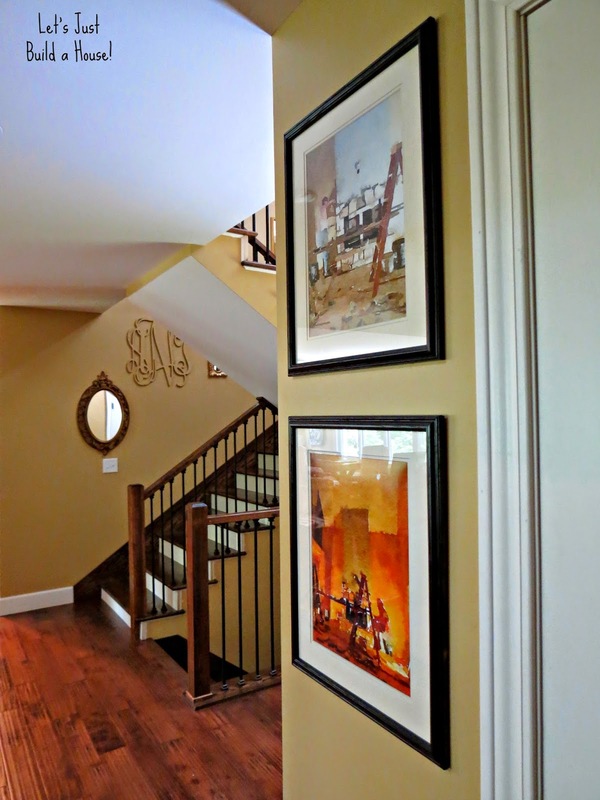 Do you have meaningful artwork in your home? Have you tried to Waterlogue any of your favorite photos? Are you late to the Waterlogue party too? That is so cool! It looks amazing and it's so cool that it's sentimental. whoa... I like those a lot! yes, that's the best part!! Thank you for posting this, I totally forgot how badly I need to download this watercolor app RIGHT THIS SECOND. COOOOOOLLLLLL!!!!! What a neat idea! wow! your dad is so talented and the fireplace looks great. it's also such a great idea of making what he loves in artwork. Such a sweet reminder of the all the handwork your dad put into your home!